This week I needed to make a main course for a casual supper outdoors on the patio. I always enjoy making quiches as the flavours can be varied and this goes well with a green salad. 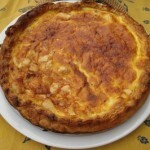 Everything can be prepared in advance and the quiche popped in the oven just beforehand. I love the aroma of truffles and have been wanting to make a recipe with some of the white truffle products that I have in the shop. I think the key to success is not to add too much or it becomes too pungent. For my quiche I decided to combine some white truffle oil, white truffle butter and chicken breast meat. The combination worked beautifully and the quiche had a delicate waft of truffles as I served it. Grease the quiche pan and line with pastry. I use ready made and just shape it to fit the pan. Place in the fridge to firm up a bit. Chop up the chicken breasts into small cubes. Melt the ordinary butter in a heavy based frying pan, add the chicken cubes and gently cook on both sides until the outside colour has changed to blonde (about 5 minutes). Layer the cold chicken pieces across the base of the cold pastry base and leave in fridge. Prior to cooking preheat oven to 180 C degrees. Aadd the cream, milk and 4 drops of white truffle oil. Pour the egg mixture over the chicken pieces and put straight into the preheated oven. Cook for about 25 minutes until firm – maybe a few minutes longer If the mixture still seems a bit soft. Remove from the oven and add small teaspoons of the white truflle butter over the top of the quiche. (I used about ½ of the jar). Serve hot accompanied by a fresh green salad tossed in a vinaigrette of walnut oil and light flavoured vinegar such as white wine vinegar. 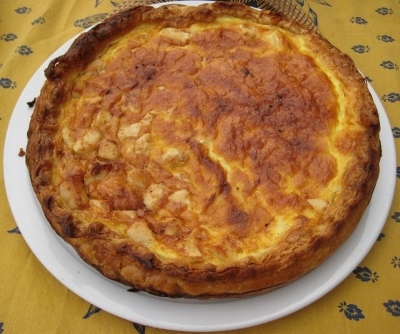 I recommend serving this delicate but fragrant quiche with a buttery chardonnay.